As required by the Appellation of Controlled Origin 'Rum of Martinique', the Trois Rivières Amber rum has been aged between 12 and 18 months in oak tuns. As required by the Appellation of Controlled Origin 'Rum of Martinique', the Trois Rivières Amber rum has been aged between 12 and 18 months in oak tuns (amongst the largest oak barrels in the world) to gain its original fresh, sweet and oaky style. This agricultural old rum develops distinctive notes of honey, caramel, milk and toast quite apparent in the tasting. The Trois Rivières (Three Rivers) plantation was founded in 1660 by Nicolas Fouquet, Superintendent of Finances for Louis XIV, allotting himself 2000 hectares in the south of Martinique. It is only in 1785 that the rum production starts, completing the sugar production, when a powerful landlord from the north of the island, Etienne Isaïe Marraud Des Grottes, bought the plantation. After being purchased by the B.B. 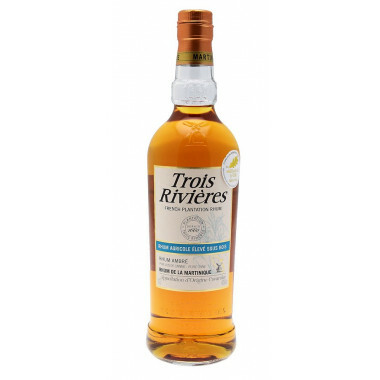 Company, also owner of the La Mauny rum, the Trois Rivières production is moved to Rivière Pilote in 2004, where is located the La Mauny distillery. The precious original continuous still, that brings all of Trois Rivières characteristics, is reassembled on the new site, securing the quality of the spirit. The Trois Rivières rum has held a “Martinique” Protected Denomination of Origin since 1996. The Trois Rivieres rums develop a unique mineral style characterized by its hallmark full-bodied structure and aromatic richness. As the plantation faces south the canes grow easily near the shore and receive plenty of sun, imparting to the Trois Rivieres rum all of its special characteristics, as it is crafted from pure sugarcane juice. The white rum develops a pleasant freshness and mineral edge. The good batches are left to age in oak casks for at least 3 years, to get the “Old Rum” appellation, and are characterized by a complex blend of spices and oaky flavours. The refinement of Trois Rivieres rum resides in the very specific shape of the large column still and the pouring methods kept secret by the master distillers. Colour: copper with golden highlights. Nose: warm sugar notes and dried flowers. Spicy notes appear after a while in the glass. Palate: supple, honeyed, with gourmet notes of caramel, milk and toasts. Finale: a rum bursting with fruits.